9 January 2016. 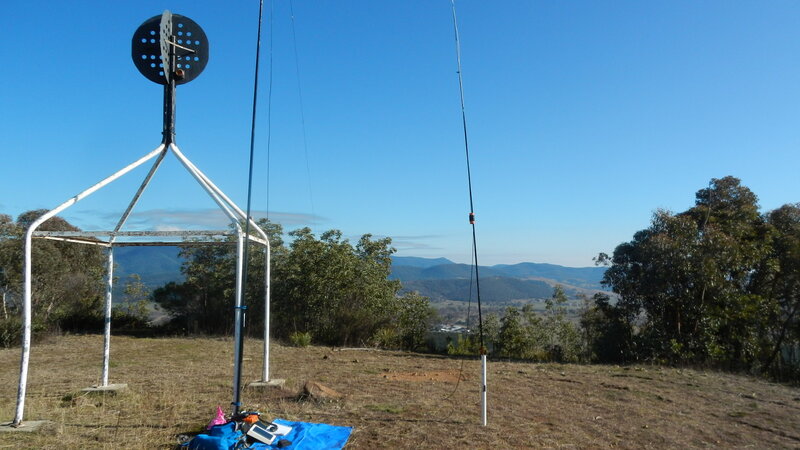 Today from a SOTA peak (Yellow Rabbit Hill) 40 km west of Canberra using this antenna during a sporadic E opening, I worked ZL1SSW (2343 km) on 6m 50.130 MHz. My SOTA rig is a Yaesu FT-857D operating at 25 watts. 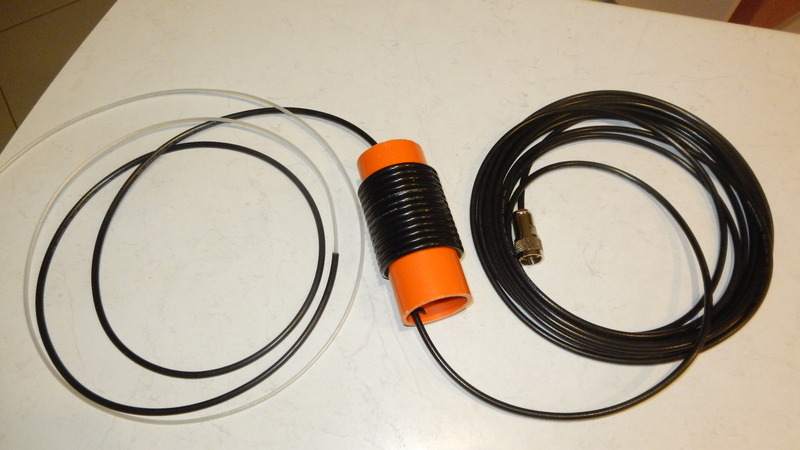 I have searched ‘ham’ radio publications and the internet for a lightweight, portable 6m 50 – 52 MHz vertical antenna design suitable for SOTA activations. 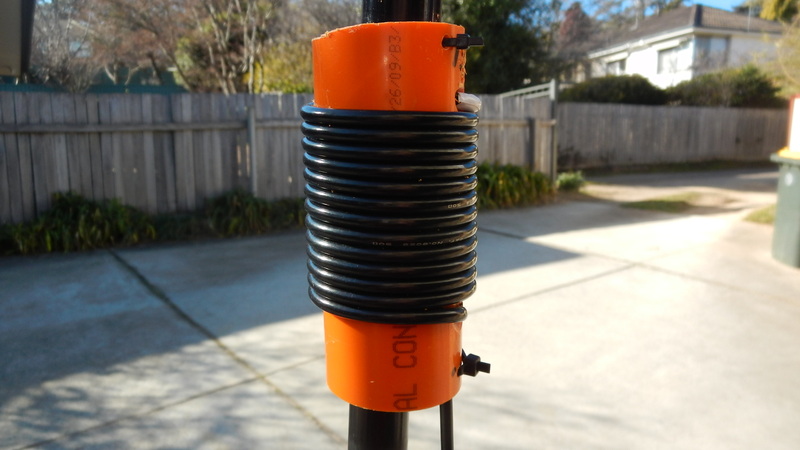 I found a terrific site by John VK2ZOI who constructed a vertical coaxial dipole named the ‘Flowerpot Antenna’ for obvious reasons. 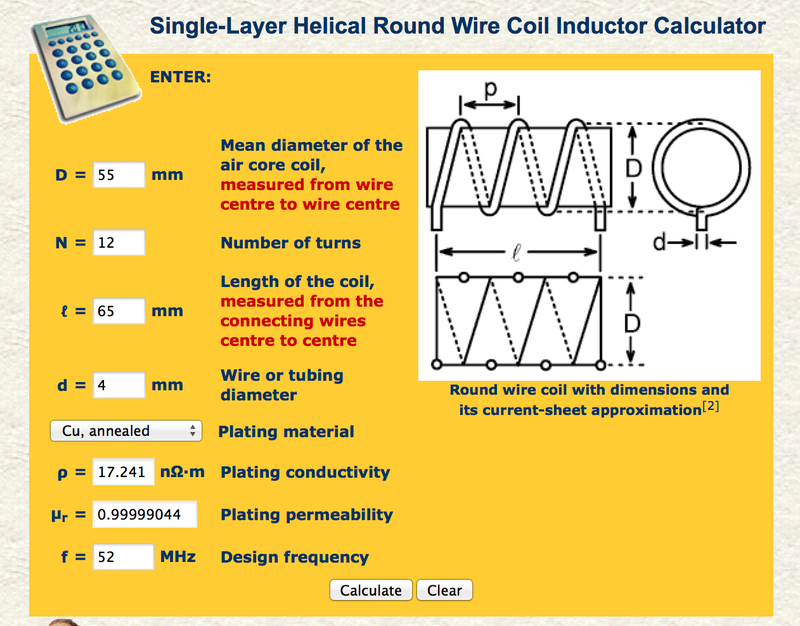 John’s design uses a single length of coax to form a choke and two 1/4 wave radiating elements forming a single 1/2 wave center fed vertical dipole. 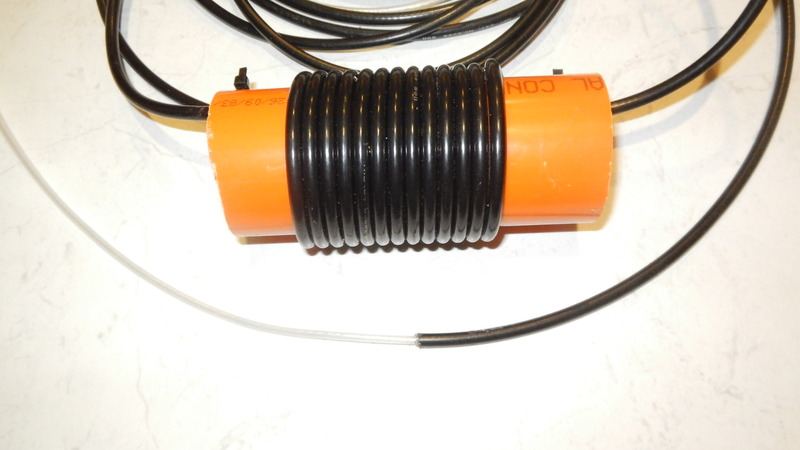 The purpose of the choke is to prevent common mode currents reaching the transceiver. The design is very simple and avoids mechanical joints, which can be an annoying point of failure particularly on a summit. 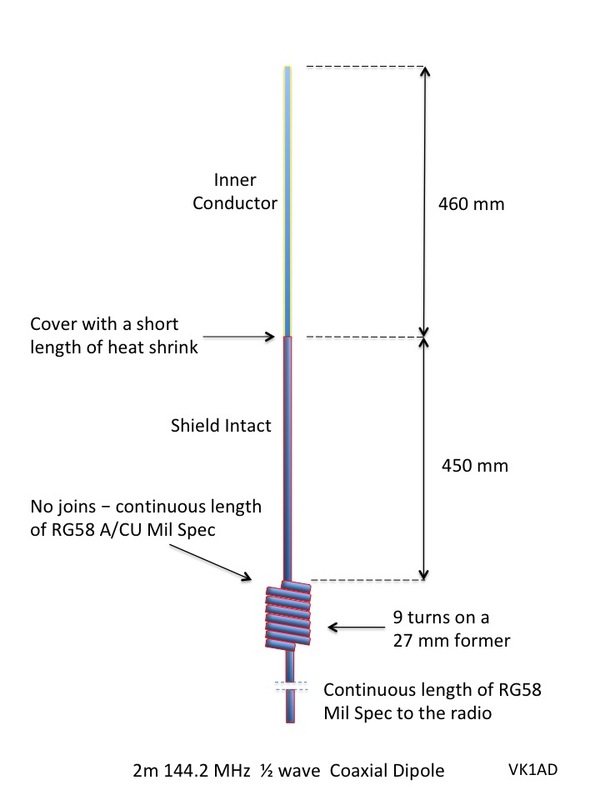 With only one solder joint at the RF connector the likelihood of antenna failure is very low. 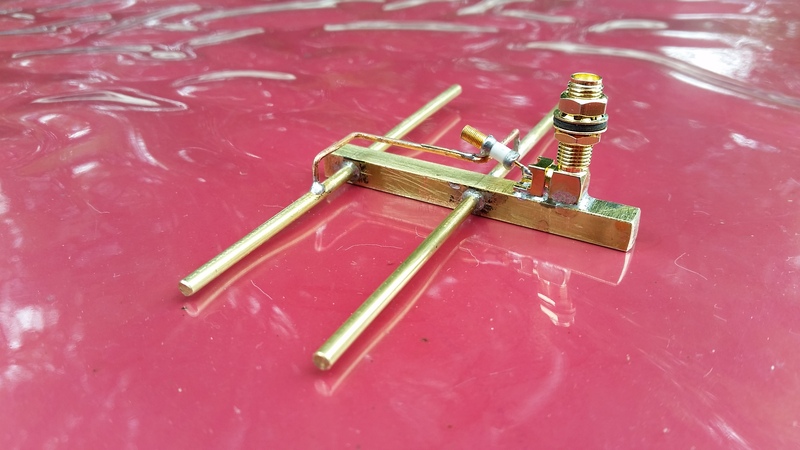 John’s design is perfect (IMHO) for use as a 6m SOTA antenna supported by a single squid pole or hung from a tree branch. 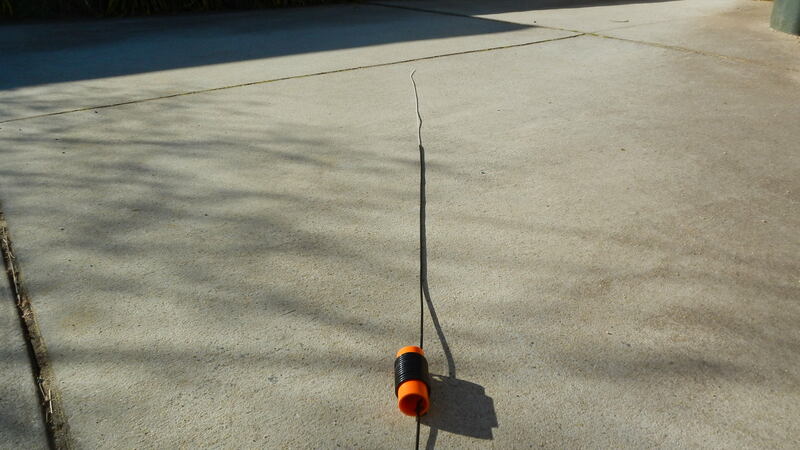 I plan to coil ‘roll up’ the coax antenna for carriage in my backpack. I have no intention of enclosing the antenna in a plastic tube as one may do for a permanent installation. 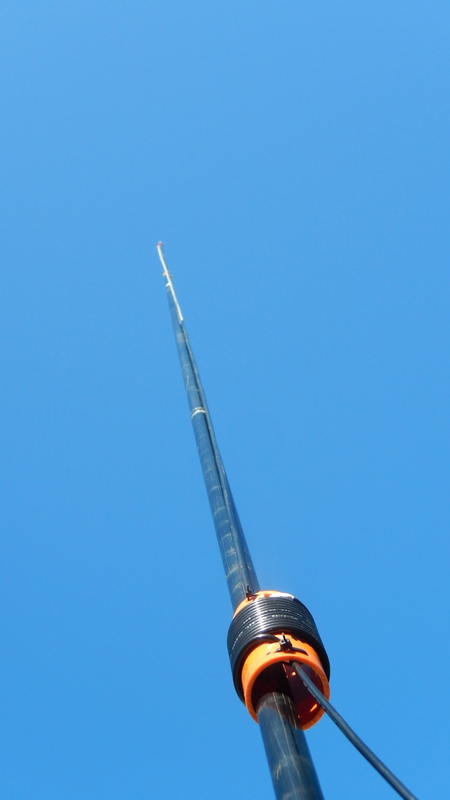 I have no plans to enclose the antenna in a plastic tube therefore according to John’s notes each radiating element must be 3% (38 mm) longer than the length shown in his article. 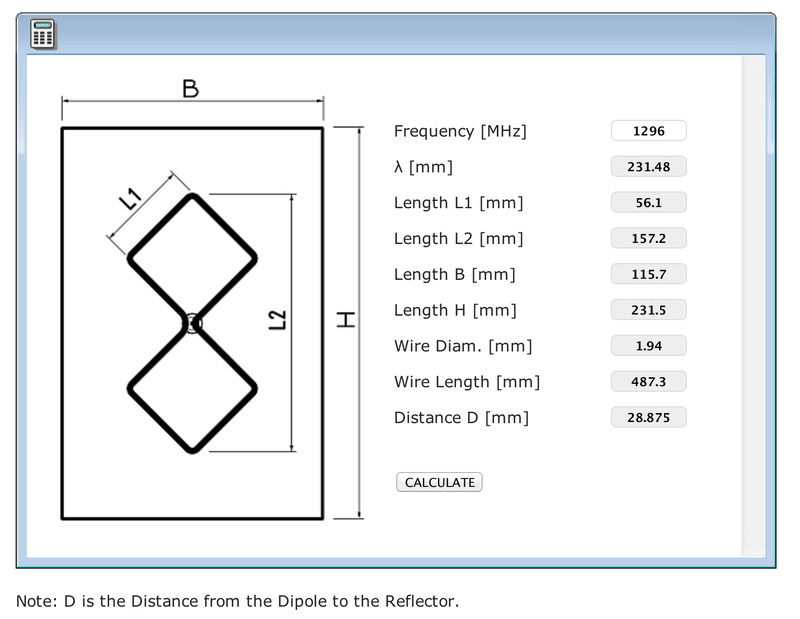 An interesting point is to compare the element lengths specified by John against the formula for a 1/4 wave element at 52 MHz = 1370 mm long (300/52 x 0.95 x 0.25 = 1.37 metres). 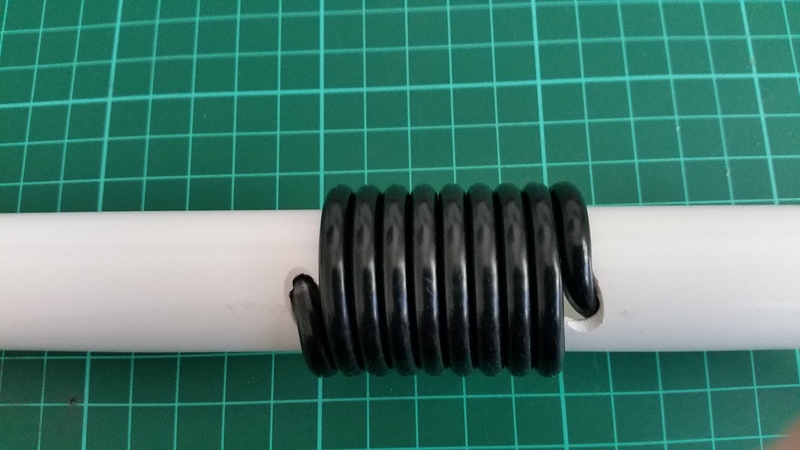 You will note the bottom half (braid section) of the coaxial dipole antenna is considerably shorter than a 1/4 wave length, most likely due the velocity factor of the coax cable. To start out I cut the top half element to 1.370 metres and after trimming the element for a low SWR, the 1/4 wave element is 1315 mm long. I didn’t alter the lower 1/4 wave element leaving the length at 1255 mm. 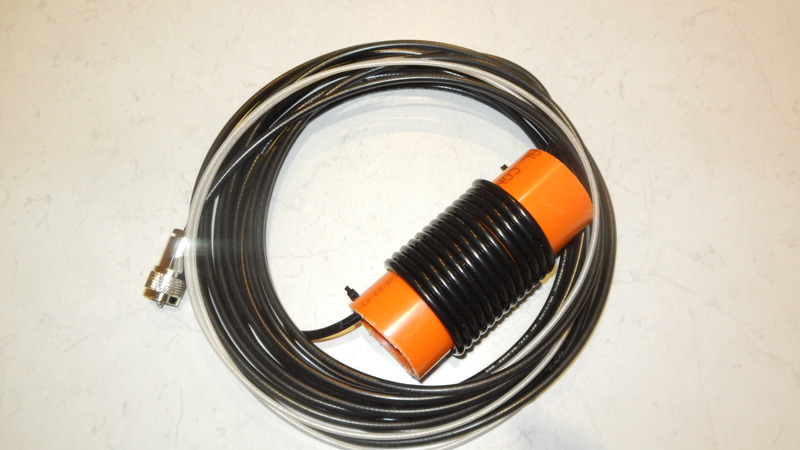 Using a 13 turn choke the SWR is 1:1 at 52 MHz with a usable 1.5:1 range from 50.75 MHz to 53.5 MHz, perfect for use as a SOTA antenna on 50 and 52 MHz. 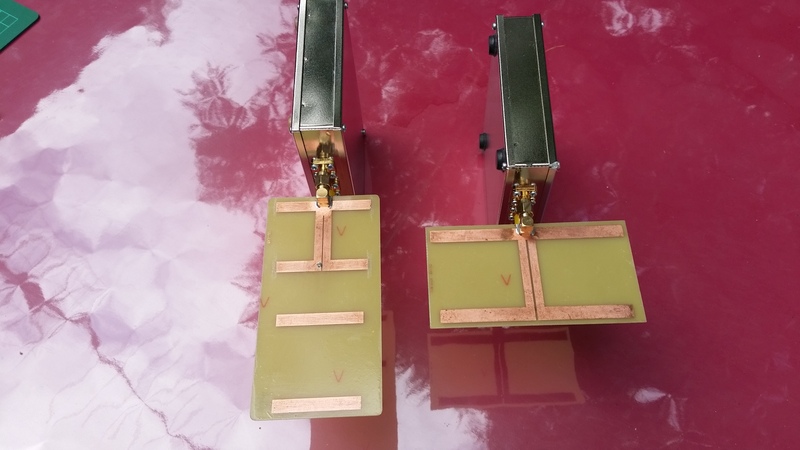 If you plan to operate in the 50 MHz section of the band, then you may like to increase the element lengths by 70 mm, the difference in wave lengths between 50 and 52 MHz. I plan to change the choke winding to 12 turns, but for now the choke is 13 turns. 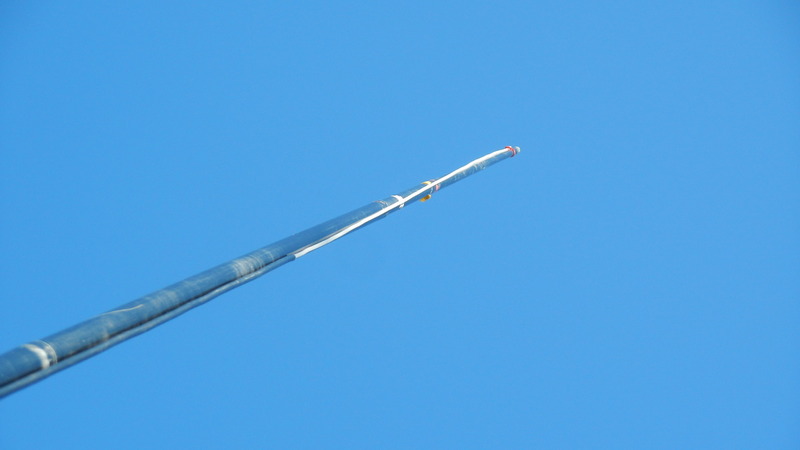 VSWR plot: Antenna is mounted on a 7 metre squid pole and clear of metallic objects. data for a 13 turn choke. 52 MHz is the nominated design frequency. 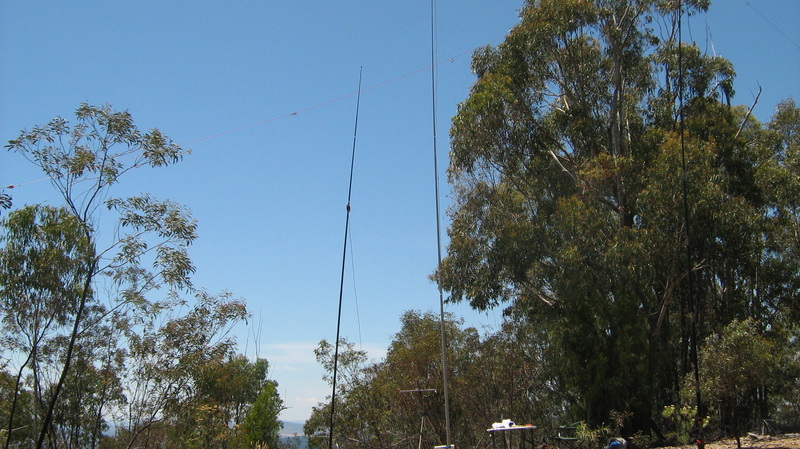 I purchased a 10 metre length of Mil Spec RG58CU from Watts Communications (Canberra). The type without aluminum foil. 1. Prepare one end of the plastic pipe by drilling one 6 mm hole in one end. Chamfer the hole to allow easy entry of the coax and reduce the stress of a severe right angle turn. (see John’s pictures). I used a tapered reamer to elongate the hole. 2. Coax cable. Start by removing 1350 mm of shield to expose the insulated core, be careful not to cut the insulation around the center wire. Trim the shield for a clean finish. Later place a 75 mm length of heat-shrink tube over the section to prevent moisture entry into the braid. 3. Next from the top of the braid measure 1255 mm down the coax. Mark this point with a permanent marker, use a colour you can see. 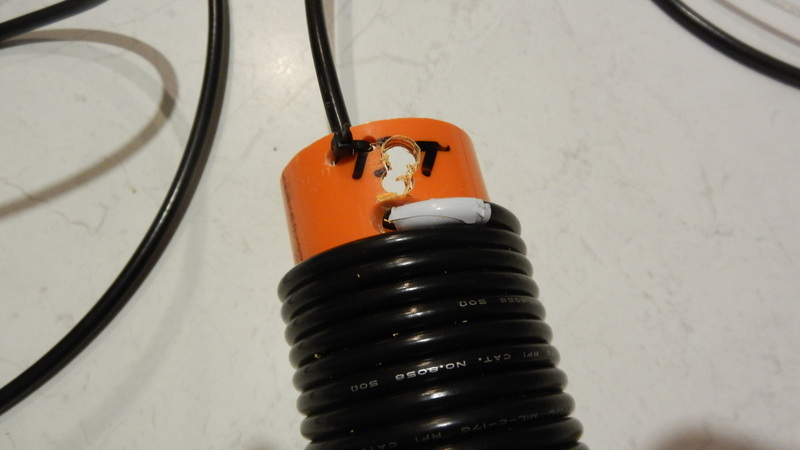 At the marked point, place a short length of electrical tape around the coax. This marks the top of the choke or where the braid radiating element exits the choke. Do not cut anything! 4. Next, feed the coax through the center of the tube and out through the top hole and stop where you marked the coax with the electrical tape. Remember this is the start of the radiating element. Next wind 13 even turns of the coax around the 50 mm former, hand-pressure is enough when winding the turns. At the completion of the 13th even turn mark the plastic pipe and repeat the exercise in drilling and elongating the 2nd hole. 5. 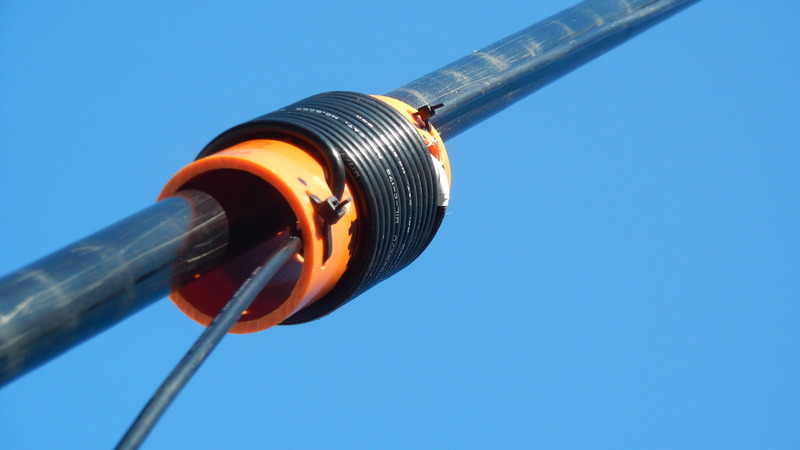 With the 2nd hole complete feed the remaining coax through the hole, gently remove any slack in the coil. The coax should exit the tube through the center of the tube. At each end of the tube use cable ties to secure the coax on the inside wall. 6. Next inspect the radiating elements for damage and double-check the length of each element. If all okay fix a RF connector (of your choice) to the end of the coax. I fitted a water-proof PL259. That’s it done! 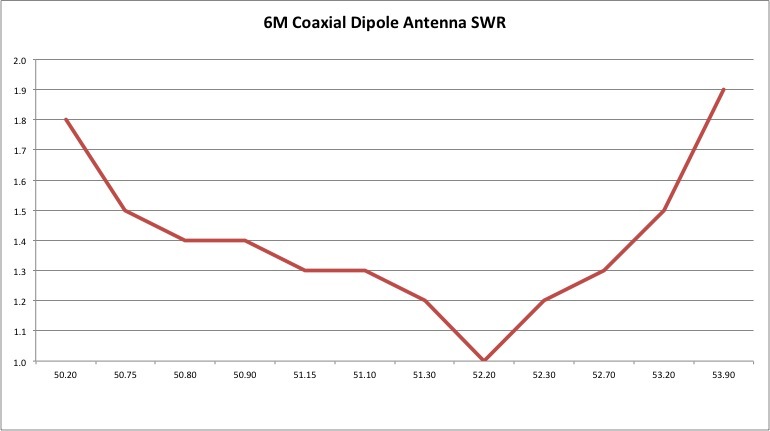 Hoist the antenna up a non-metallic pole and check the SWR at the lowest frequency. I used a 7 metre squid pole. Check the VSWR and ‘trim’ the dipole top section to lower the VSWR (I reduced this section by 35 mm). If you cut too much off, you have the option to cut the cable ties and feed more coax through the former or solder a short length of wire to the existing core, and start again! Please feel free to offer constructive feedback. I am a humble ‘Standard’ licence holder, not a ‘full-call’ and not an electronics engineer. Please don’t shoot me down, rather take the opportunity to offer constructive feedback and share your knowledge on how I might improve the antenna. I don’t have antenna simulation software on my MAC Air. If someone would like to produce radiation charts based on the dimensions discussed and for various heights above ground, I am happy to include the charts here. 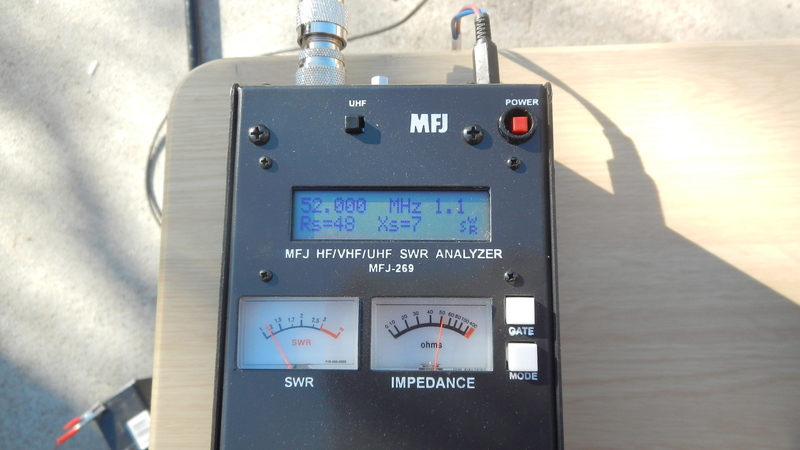 On-air tests have shown the antenna performs well. 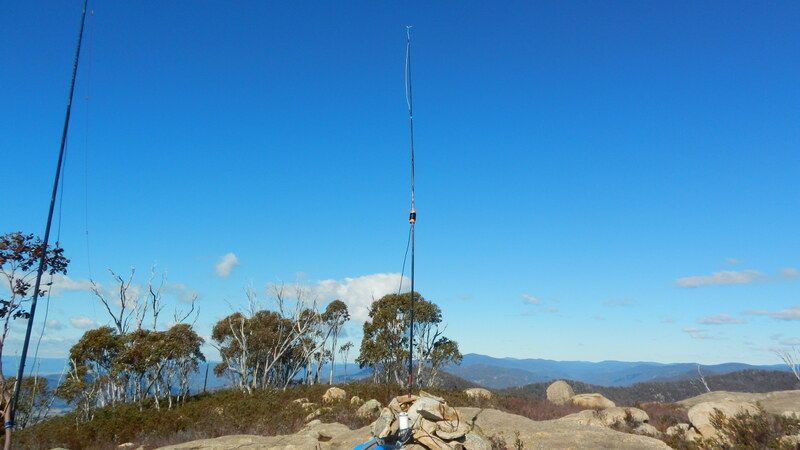 From the summit of Mt McDonald, using a FT-817 and 5 watts output on 52.2 MHz SSB, I made contact with Gerard VK2IO on Mt Marulan, 105 km north. Our antennas were opposite in polarization, Gerard was using a horizontal dipole. 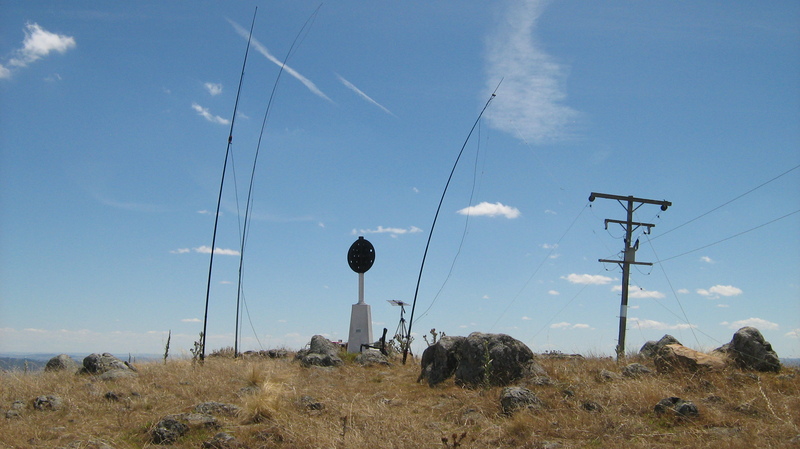 Local VK1 and VK2 SOTA chasers those, within a 30 km radius were well received most with signal reports at 5-7 to 5-9. What next, well I am now seeking interest from VK SOTA activators to attempt a 6m S2S contact using two vertically polarized antennas. I can wait for the summer sporadic E season. center of the antenna 1/4 wave elements. Do not connect the braid to the core. Overlay this section with a short length of heat-shrink tube. 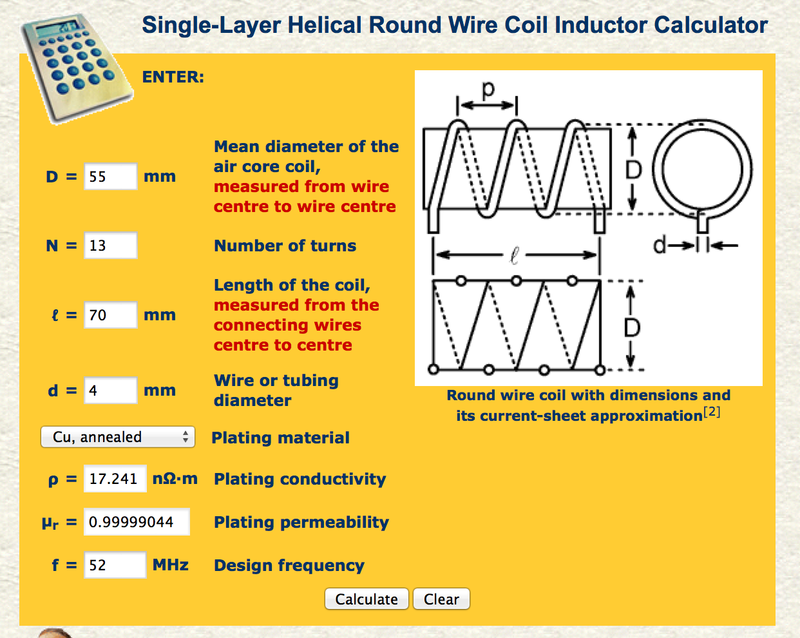 The self-resonant frequency of a 12 turn coil is closer to 52 MHz. I am yet to experiment with a 12 turn choke and the effects on each 1/4 wave element length. Thanks for the feedback Rob and it’s good to know others are experimenting with homebrew antennas. I have worked similar distances at 5 watts SSB into far North Queensland and New Zealand. Well done Rob! Thanks for this detailed blog post, I recently built the same design based on your recommendation to use during the VK1 6M SOTA day, worked brilliantly. My pleasure Wade, I’m pleased to read this blog has been of value to you. Thanks for the feedback.